Mark describes as 'engineering in wood' with very fine detail in his pieces, he also has a passion for design and aesthetics which he holds in the same regard as technical aspects. For Mark, this makes his work not only mesmerising from a technical perspective but also beautiful and interesting to look at. Ken was also very happy to help and share his ideas, methods and enthusiasm, and so this profile was born. Ken's work is incredibly intricate and instantly reminds me of the work of Hans Weissflog in terms of its complexity and how he overcomes physical and technical boundaries in his work. His use of minute elements and attention to detail shows remarkable skill and mastery. Ken is perhaps best known for his boxes, the most notable of which won the People's Choice Award 2011 - Third Annual Box Exhibit at Dunn Gallery. 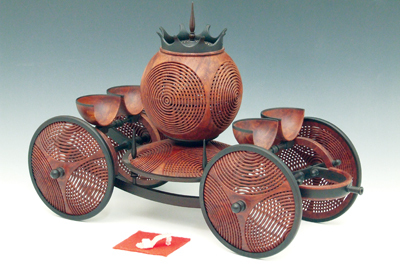 The overwhelmingly popular piece 'The Emperor's Carriage' demonstrated Ken's remarkable technique and execution of design. The son of a cabinetmaker, Ken was born in 1950 in Melbourne, Australia. He was introduced to woodworking by his Father at an early age. Ken explains that his Father was something of a jack of all trades; not only did he have a broad spectrum of skills to pass on to him but he was also a perfectionist. "He expected no less from his son," Ken explains. "My earliest memories are of me working with him in his shed. He goes on to tell me how he completed a technical school education and decided that a career working with wood was not for him. Ken explains that the ever changing world of electronics offered him more stimulating challenges: "I completed an apprenticeship and continued working as a service technician in the television and audio industries. I started my own manufacturing business in 1980 producing audio equipment and speaker enclosures. My wife and I ran this business until retiring in 2007." Although Ken didn't actively pursue a career working with wood he has continually worked with it over the years. Ken was part way through building a house at his country property in 2000, when his wife asked him what he would like for Christmas: "The house was split level and on the side of a very steep hill. The design of this house meant that there would be lots of stairs and rails requiring balustrades. I thought that these balustrades would look nicer if they were turned, so I asked for a wood lathe." Ken's re-discovery of turning started here. During his trade training Ken tells me that he had to make a few screwdriver handles and this was the only time that he had used a wood lathe, but how hard could it be to learn? Ken's wife knew his thoughts on cheap tools and equipment so she bought him a Woodfast lathe. Last year Ken finally finished fitting all of the balustrades - but none of them are turned. Having his own lathe allowed him to explore the vast possibilities which turning offered and rather than turning balustrades for staircases, Ken's work developed in a far more sculptural direction. So how does Ken describe his turning style and the types of work he produces? 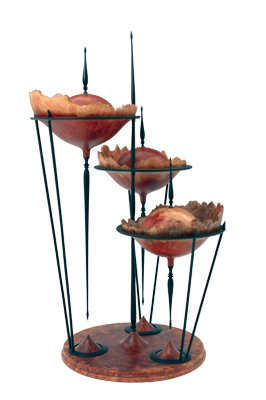 Ken comments that his sculptural work has often been described as delicate and sometimes almost fragile. 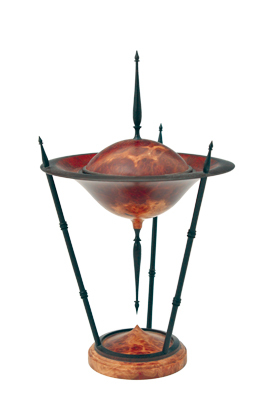 His pieces are normally made up of numerous components turned to tolerances usually reserved for metal. Although his work is highly technical and bordering on impossible, Ken tries to make all of his pieces as visually pleasing as possible: "The flow of the shape and the colour of the wood are just as important as turning skills. If I get all of these things to come together in one piece I usually obtain the 'wow' factor that I am looking for." And we can verify that Ken's pieces certainly do make us stare in wonder, especially pieces such as 'Ribbon of Life' which is reminiscent of a complex strand of DNA and 'Interceptor', a complex space ship which comprises a multitude of beautifully turned finials in Australian ebony. Ken says that living in Australia is a major advantage as it gives him access to literally thousands of different species of wood: "We have some of the hardest and arguably the prettiest woods in the world," he says. "The strength of the wood enables me to produce fine turnings and the variety of colours gives me a palette to paint with. The majority of my work at the moment is turned boxes, though in the past I turned my share of platters and bowls." When I asked Ken about how long, typically, it takes him to complete one of his pieces he tells me that this varies greatly depending on the complexity: "The simplest box of my design takes about two days to complete. 'The Emperor's Carriage' box took four months to complete - and this was after many months of planning. The time it takes to complete a piece is not important when only the end result matters. The finished piece must be as close to perfect as possible no matter how long a piece takes to complete." Ken says that he is often asked where he gets his inspiration from: "To be honest, I really don't know. A frequent observation of my work is that my brain seems to be wired differently to most people. There's some truth in that, as I continually get visual images of possible projects. These images are always three-dimensional and contain fine detail," he tells me. He explains that once an idea presents itself, Ken feels a desire to draw it. All of his work starts out that way with a very simple drawing. Ken calls them his 'chicken scratchings' because that's what they look like until they are realised in wood. Ken draws free-hand for a variety of reasons. Firstly, it's a quick way to store an idea before you lose it. He can then come back to it later and see whether the idea has merit. Often the sketches are on a piece of scrap paper - or whatever he has to hand.Secondly, the sketch allows Ken to play with shapes before any wasteful tool work: "I am a firm believer in dictating the terms with the wood rather than the other way around. If a piece of wood isn't behaving, I toss it out and start again with a fresh piece. Life is just too short to be working against the wood instead of with it." The other main benefit in sketching is that the drawing captures the improbable: "Sometimes, I draw things that are impossible to turn, only to mull on the problem for weeks or months before a solution appears. It doesn't all happen overnight." From these rough sketches Ken produces detailed full sized drawings of each component, using his drawing board. Once these drawings are completed he makes all the required templates, searches for the perfect piece of wood and then turns the finished piece. When I asked Ken how his style of work has changed and evolved since he first started turning, he explains that when he first started turning he found the best way to hone his skills was to enter competitions. In 2002 he entered a national competition as a novice and won numerous prizes. 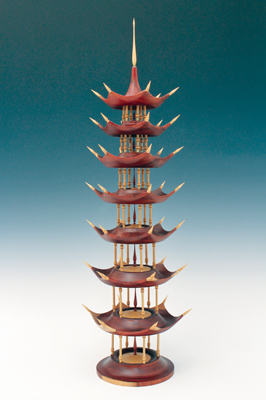 By 2004 he was winning best of show in the open section against professional woodturners. He has won best of show five times and on a number of occasions every major prize. That included entries in all sections, including bowls, platters, spindle turning and boxes. "While competitions helped me dramatically improve my turning skills, the strict criteria of entry stifled my creativity and controlled what I made. I stopped competing two years ago and this has finally freed me to produce what I like, which is predominantly turned boxes using the widest range of woods available." Ken says that not entering competitions has also allowed him to pursue a broader scope of turning. For example, he is now free to turn a number of individual pieces that make up a series. The person that has had the greatest influence on Ken's woodturning would be Vic Wood. After his wife gave Ken the Woodfast lathe, she noted that he was struggling to master his new toy, so for his upcoming birthday present she organised lessons for Ken with Vic. These basic lessons were exactly what he needed and were the beginnings of a lifetime friendship between the two turners. he doesn't know why he let me." "I have only made two of these boxes as I never intended to copy the work of Hans, I only wanted to master the skills," he explains. 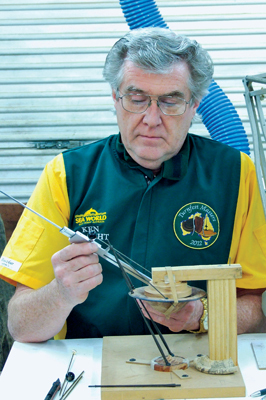 Ken also comments that Vic has also encouraged him to take the next step in his woodturning, whether that be in teaching, demonstrating or simply pushing the boundaries of what can be achieved. Ken starts by telling me that his workshop is somewhat of a sore point, so obviously I was intrigued to find out more! Ken explains that before retiring, he built a 240 sq.m workshop at their country property. It was fitted out with woodturning, woodworking and sheet metal machines, as Ken makes a lot of templates from this material. There was also a slabbing mill and countless racks of wood complete with forklift for ease of handling; everything a retired woodturner could possibly need. His plan was to spend much more time in the country and enjoy his large workspace but two years ago his daughter put a stop to this: "She gave birth to our only grandchild,â€ he jokes. "I am now back working in my city workshop which is a two car garage crammed full of woodworking machines including three lathes. Like so many others living in suburbia, I have little room to store my wood collection and make frequent trips to my country property to obtain what I need to complete even the most simple of projects," he tells me. When I asked Ken about the special tools in his workshop that he could not do without he comments that the single biggest factor that controls the outcome of a finished piece would have to be the sharpening of his tools. He relies 100% on the Tormek wet stone grinder to give him consistently razor sharp edges on all of his tools: "Without it, I wouldn't be able to turn anywhere nearly as accurately. More importantly, some of the grinds on my tools like my mini chisels can only be achieved on the wet stone grinder. Normal 'spark' grinders only burn and fail to put a decent edge on the tools,â€ he explains. Ken explains that he has spent most of his working life designing and building electronic equipment on production lines. To be successful in this type of work environment you must pay attention to every detail, no matter how small, he explains: "Being able to bring this attention to detail to my woodturning has been a great asset. 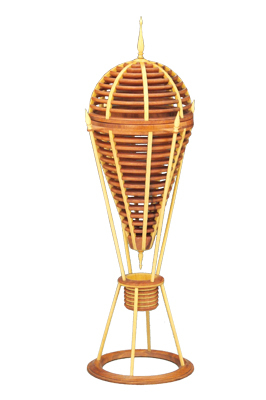 I often tell other woodturners that the winning of a competition or making of a sale is all in the detail." Ken spends an inordinate amount of time with the finish of a piece in particular, and it shows in the end product: "I work to fractions of millimetres and make extensive use of templates and carriers when turning. And I work typically to drawings - I rarely if ever 'free-hand' a turning like others seem to do," he says. He tries to pass all of that on to his students wherever possible and Ken's students tell him that not only does he teach them accurate turning techniques, but that they always leave with a different mindset. When I asked Ken about any particular high or low points he has experienced during his turning career, he says that he is lucky enough not to have had any lows, although the highs have been numerous. Ken cites the first time he saw one of his pieces featured in a magazine and winning major prizes in competitions or knowing that somebody paid serious money for one of his pieces. "Teaching a novice to turn their first completed piece always brings a lot of satisfaction. Demonstrating to large audiences is also challenging and rewarding," he tells me. Of course, the highs are not always so obvious. Ken comments that he really gets a kick out of seeing a line of turners working to his drawings at local woodturning get-togethers. Ken explains that the reason he loves turning is that it keeps his brain and body active whilst giving him an outlet for his creativity: "This kind of freedom is something that I have not had during a working life in business. More importantly though would be the people that I meet. Woodturners in the majority are a great bunch of friendly, fun loving people." Ken tells me that he was once told by Vic Wood that most woodturners' skills slowly improve then plateau and never improve much after that, and his aim is to never let this happen: "While my skill set continues to improve so should my work. A main priority is that my turning rather than embellishing be at the forefront of my work. I often see work that is well decorated but the turning itself is substandard. While the efforts involved in what I call 'painting and decorating' no doubt can involve considerable skill, it is not a direction I want to head in," he explains. Ken has only been selling his work for the last couple of years and he feels he probably needs to convince himself to sell more, but he usually feels sad when a piece sells: "It's like part of my journey is missing," he comments. â€œWhen a piece sells I often make another and just put it aside for later reference. I find it difficult to work out where I am heading when I can't see where I have been." In terms of future directions, Ken acknowledges that his skill set still seems to be expanding exponentially thus giving him the opportunity to experiment with as yet untried turning techniques, and we are excited to discover which directions Ken will be taking with his work in the future. It was a pleasure to profile this remarkable turner and his exquisite work. Vena Amoris: This box started out as a commission. I was asked to make a box for a lady suffering from cancer who did not have long to live. The box was to hold her rings at home and during her many visits to hospital. When she finally passed away the box and rings were to be given to her daughter. Making the box was easy, but no matter how hard I tried I could not come up with a name for it. I placed a picture of the box on the World of Woodturners website in America and asked for help with a name. There were plenty of suggestions, but the one that stood out came from a friend of mine who lives in the far north of Australia. According to him, the vein in our left ring finger is called Vena Amoris. The early Romans believed that this vein ran from the finger to the heart and symbolised love. That is why wedding rings are worn on that finger. The name seemed to fit this commission perfectly. Morphine: Three years ago I fell off a roof and broke my back. While I was in hospital with nothing to do I designed a number of pieces. Three months later when my back brace was removed I started turning them. The first piece that I completed I named Static Motion. This piece was nothing like anything I had made before and when my wife first saw it she could not decide whether she loved or hated it. When people looked at this piece my wife would jokingly tell them it was the Morphine that designed it. Her name stuck and mine was soon forgotten.